Dr. Harry Kamenidis earned his medical degree at Boston University School of Medicine. 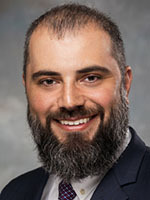 He completed his internship in General Surgery and residency in Urology at University at Buffalo Jacobs School of Medicine and Biomedical Sciences, where he also served as Chief Resident in Urology. His training included robotic surgery at Buffalo University affiliated hospitals. He enjoys practicing in all areas of general urology with particular interest in BPH (benign prostatic hyperplasia/enlarged prostate), stone disease, erectile dysfunction, male and female incontinence, and robotic surgery. In his spare time, Dr. Kamenidis enjoys family time with his wife and two young children, traveling, reading and playing basketball.